I think there is none who'd never tasted water after eating gooseberry. I remember my childhood days; I eat this fresh gooseberry and rush to drink a glass of water as soon I finish it. I still do that ;). When I was pregnant, my chithi used to insist to have at least one gooseberry each day. But I used to forget that often and it would lay untouched in my refrigerator for days together.. So I made pickle with 8-10 gooseberries with little salt and oil. From that day, I survived with pickles that I make in lesser quantities like instant mango pickles or those I bought from India. Somehow, I do not like to have store bought pickles because of its highest percentage of vinegar in it. The only exception is vadu mangai oorukai (baby mangoes- pickle). I buy that from stores as I've still not learnt that recipe. But since my Hus is going to stay here alone for a month, I thought why not prepare it in quite larger quantity. Though he is not fond of pickles as I am, it would be savior if he doesn't gets time to prepare any side dish for rice. Wash Gooseberries and pat them dry. In a bowl, add little salt and gooseberries. Stir it well and keep it aside for 5-10 minutes. 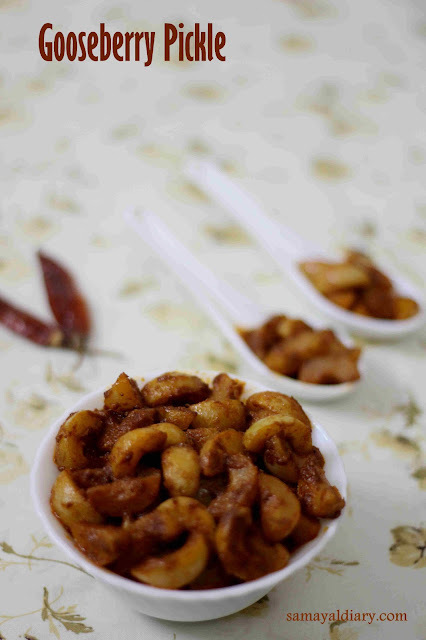 Steam the gooseberries using a steamer or Idli cooker for five minutes. Remove the gooseberries and set aside to cool for few minutes. Meanwhile, dry roast the methi seeds. Grind it to a powder. Add chilli powder, salt to the ground methi seeds mixture. Mix well and keep it aside. Wipe the gooseberries with a tissue paper or a clean kitchen towel to remove the moisture, if any. 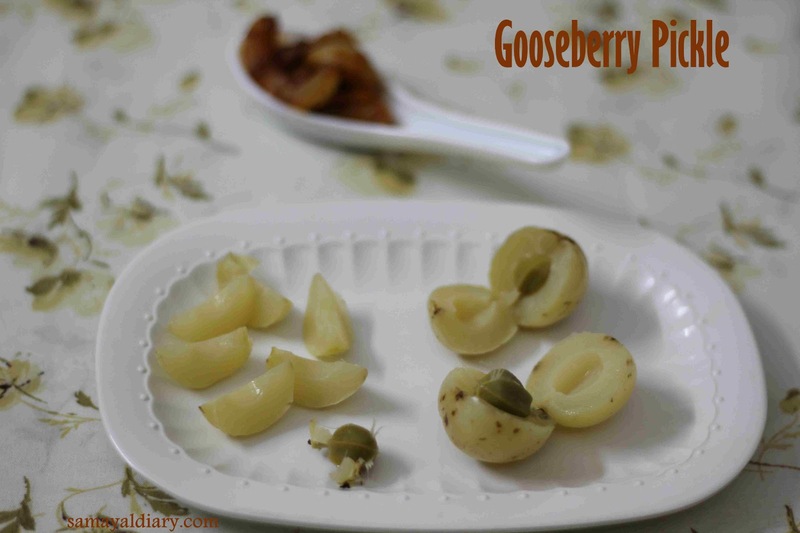 Press the gooseberries with your fingers along the sides. It opens into two parts. Remove the seeds and then gently divide into small parts. My Mom uses the whole gooseberries as such without dividing into parts; but I prefer this method as sometimes I feel a just a half gooseberry is enough while eating with curd rice. So I prefer separating them into parts. Pour the spice mixture onto the split gooseberries. Mix well and keep it aside. Heat oil in a Pan. When hot, switch of the flame. Once cooled, pour the oil over the gooseberries-spice mixture. Mix well. Store in an airtight container. This stays for more than two months. However store in a cool and dry place; use a dry spoon. Mix the pickle as often as possible. My pickle is quite less hot. 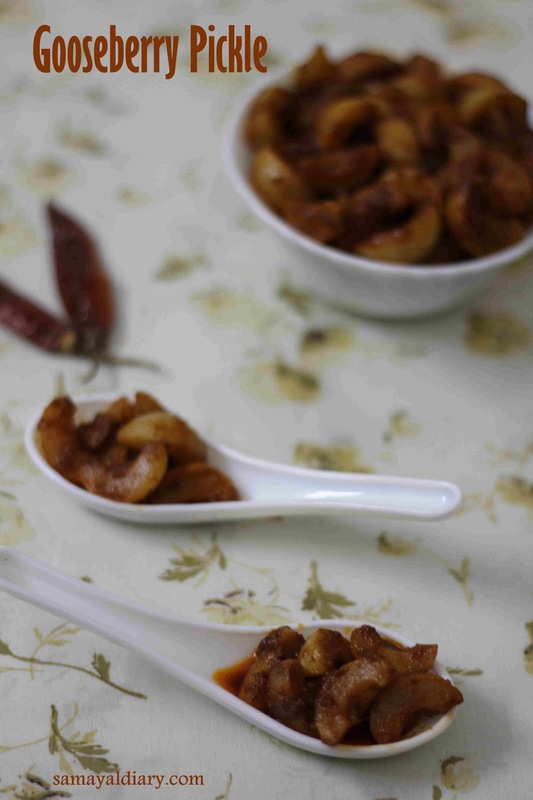 Adjust chilli powder according to your taste preferences. Dry roast the chilli powder if it is not very fresh as this would remove little amount of moisture, if any. If using chillies, dry roast and cool them before grinding. 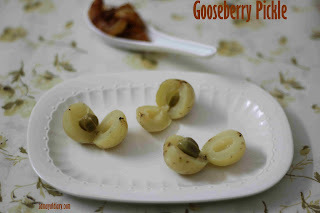 Use good amount of oil so that the gooseberries gets immersed. Linking this pickle recipe to vegan thursdays. 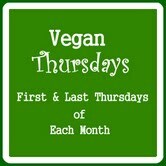 We share purely vegan recipes for vegan thursdays. This happens every first and last thursday of each month. To know more or to join, click here. wow tis is such a quick n yumm one..
tempting pickle.. looks too good!! healthy pickle laxmi.. i follow different version.. Mine is quite different from yours, would love to taste urs too..looking great.